Summary: The early days were perilous for the Republic. The founders flirted with military coup and tyranny. Here Jefferson tells about one such moment of weakness. Today we’re experiencing another. But we can, as they did in 1776 and 1781, prevent America from into tyranny. Please read this prescient warning in Notes on the State of Virginia by Thomas Jefferson (1781; text here). He describes one of the Republic’s early brushes with tyranny. In December 1776, our circumstances being much distressed, it was proposed in the house of delegates to create a dictator, invested with every power legislative, executive and judiciary, civil and military, of life and of death, over our persons and over our properties: and in June 1781, again under calamity, the same proposition was repeated, and wanted a few votes only of being passed. One who entered into this contest from a pure love of liberty, and a sense of injured rights, who determined to make every sacrifice, and to meet every danger, for the re-establishment of those rights on a firm basis, who did not mean to expend his blood and substance for the wretched purpose of changing this master for that, but to place the powers of governing him in a plurality of hands of his own choice, so that the corrupt will of no one man might in future oppress him, must stand confounded and dismayed when he is told, that a considerable portion of that plurality had meditated the surrender of them into a single hand, and, in lieu of a limited monarch, to deliver him over to a despotic one! How must we find his efforts and sacrifices abused and baffled, if he may still by a single vote be laid prostrate at the feet of one man! In God’s name, from whence have they derived this power? Is it from our ancient laws? None such can be produced. Is it from any principle in our new constitution, expressed or implied? Every lineament of that expressed or implied, is in full opposition to it. Its fundamental principle is, that the state shall be governed as a commonwealth. It provides a republican organization, proscribes under the name of prerogative the exercise of all powers undefined by the laws; places on this basis the whole system of our laws; and, by consolidating them together, choses that they shall be left to stand or fall together, never providing for any circumstances, nor admitting that such could arise, wherein either should be suspended. No, not for a moment. Our ancient laws expressly declare, that those who are but delegates themselves shall not delegate to others powers which require judgment and integrity in their exercise. … The same laws forbid the abandonment of that post, even on ordinary occasions; and much more a transfer of their powers into other hands and other forms, without consulting the people. They never admit the idea that these, like sheep or cattle, may be given from hand to hand without an appeal to their own will. Was it from the necessity of the case? Necessities which dissolve a government, do not convey its authority to an oligarchy or a monarchy. They throw back, into the hands of the people, the powers they had delegated, and leave them as individuals to shift for themselves. A leader may offer, but not impose himself, nor be imposed on them. Much less can their necks be submitted to his sword, their breath be held at his will or caprice. The necessity which should operate these tremendous effects should at least be palpable and irresistible. Yet in both instances, where it was feared, or pretended with us, it was belied by the event. It was belied too by the preceding experience of our sister states, several of whom had grappled through greater difficulties without abandoning their forms of government. When the proposition was first made, Massachusetts had found even the government of committees sufficient to carry them through an invasion. But we at the time of that proposition were under no invasion. When the second was made, there had been added to this example those of Rhode Island, New York, New Jersey, and Pennsylvania, in all of which the republican form had been found equal to the task of carrying them through the severest trials. Next Post What does the future hold for the US Army – and America? From whence has our laws derived their power? NOT from the infinitely automatically self-renewing consent of the governed! No, some of us did not agree to these laws; they do not apply. If you wish to negotiate, we stand ready. The fallacy of republic and democracy is that it is inheritable. 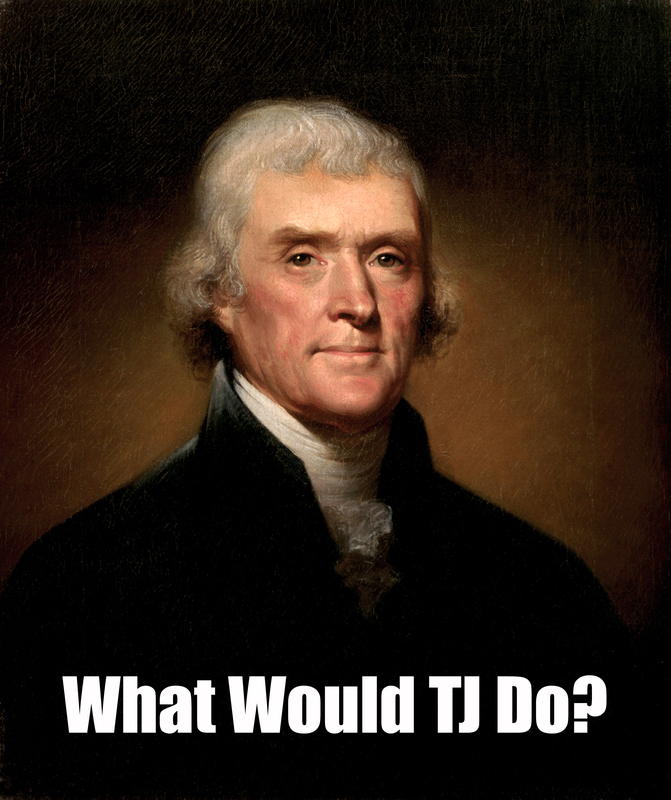 Jefferson was, was he not, the author of the quotes below? You are simply silly. Try already THERE! The Bankers are owned by the Gov and are literally employees of the USA and own the Halls at the same time. What is fascinating is that there are people who actually believe the Authorities that there is a functional Democracy left in most of the West. Pure Fiction. Breton seems a bit hysterical. Can we calm him down? We still hold elections. Nobody puts a gun to your head, forcing you to vote — and for whom to vote. Breton should visit some real autocratic states; the experience would be enlightening. (2) Bold statements by Jim Grant (of Grant’s Interest Rate Observer) and Zero Hedge. Both of these are entertainers, not serious analysts. I’ve read Grant often for 25 years. He’s fun to read, often has interesting insights, and is usually wrong. His knowledge of economic theory is minimal. Zero Hedge publishes excerpts from valuable and difficult to obtain sources (eg, research from Goldman Sachs and J P Morgan). And provocative if sometimes exaggerated sources (Washington’s Blog). And lots of nonsense. Most of ZH’s own commentary falls in the latter category. It’s famous for gross misrepresentation of simple data: confusing seasonally adjusted for NSA data, cherry-picking from good economic/financial data to make it look bad, seriously reporting absurd rumors (they frequently report routine deployments as signs that we’re about to attack Iran, and normal geological data as imminent volcanic eruptions). Where to go for reliable information and insights? See Economics can help understand events in America and the world. Here’s where to find those answers. My first article about this was at the onset of the housing bust: Diagnosing the eagle, chapter I — the housing bust, 6 December 2007. I flagged the nature of the Paulson Plan at its inception: Slowly more voices are raised about the pending theft of taxpayer money, 21 September 2008. I’ve written 13 detailed articles about this. See the FM Reference Page Theft pretending to be solutions. Can Breton point to anything he wrote at that time of similar accuracy? In defense of Breton, lots of countries still have elections…but that doesn’t necessarily mean that those elections are genuinely fair, meaningful, or indeed much more than a farcical charade. As an example, I find the way in which the two parties who control our government have attempted to exclude other parties (such as the Green Party) from debates both at state and federal levels to be very interesting — and troubling, In a sense, Breton is right…we are already living under a kind of semi-benevolent tyranny, one dominated by the Democrats and Republicans (who aren’t nearly as different from each other as they pretend to be) and governed primarily for the benefit of their wealthy corporate contributors. Absurd. You guys need to get out more, or read history, before considering the US a tyranny. That we’re too lazy to run our own political machinery does not make our ruling elites tyrants. That American voters do not elect people you like does not make our ruling elites into tyrants. Nor does the fact that we re-elect our leaders at very high rates. There are barriers to new parties. However, there are more than two parties on the ballots in most states, and the barriers to new parties are quite low. They’re difficult to cross because the new parties have very low popularity. IMO that’s a good system, as it forces voters to choose between broad coaltions — rather than vote for a host of tiny parties, who form the coalition in the backrooms of the capitol. You can disagree with this system, but that doesn’t make it a tyranny. FM, I said nothing about blocking other people from the ballot — I was talking about the being blocked from the debates — so why did you respond as if I’d claimed that they were blocked from the ballot? Frankly, that kind of tactic is beneath you. Ever thought that perhaps one of the reasons why some of the new parties (such as the Greens) have “very low popularity” is because the two main parties in any cases attempt to block them from participating in the debates? In my opnion, even if the Green Party doesn’t have a strong percentage of the vote, trying to block them from simply participating in the debates is the complete opposite of everything this country supposedly stands for. If nothing else, allowing them to participate shows the body politic that there is an alternative — which is probably the whole point! — and potentially creates an opportunity for both Democrats and Republicans (who are far too complacent) to be truly put on the spot and challenged to defend their positions instead of being thrown softball questions by self-styled journalists who are too afraid of their corporate bosses to ask hard questions. You have to admit that insanity is doing the same thing over and over again yet expecting a different result…and at this point, continuing to vote either Democrat or Republican in the persistent belief (despite all evidence to the contrary) that either one actually cares about ordinary Americans or has any real interest in changing things is an act of insanity — especially given the level of dissatisfaction with both parties among the American people. One of the reasons why our country is in such a mess is because our political system is profoundly broken — possibly beyond hope of repair — and it’s probably going to get worse (maybe even a lot worse) before it gets better. Is that the only reason? No, of course not…but the fact that the body politic is lazy doesn’t diminish the fact that the ruling elites are doing everything in their power to exploit that for their own purposes. If you haven’t done so yet, watch the documentary “Orwell Rolls In His Grave” and then tell me that the ruling elites — which doesn’t necessarily mean the ones in government! — aren’t pulling strings from behind the scenes. Comment are a difficult way to communicate, as brief and hastily written — and quickly read — notes. I think we’re talking past each other. You mentioned the debates as an example of why the elections are not fair, not the reason why elections are not fair. As I recall the literature, debates are not that significant a factor. Lack of support from the rich and large businesses prevents them from buying advertisement. Lack of grassroots strength prevents them from building local organizations. Those are the two sources of influence in American politics. Until a third party develops one or the other, we’re stuck with a two-party system. So what changed in the political system, so that we’re now in a “mess”? I consider this just an excuse. As in “we’re wonderful, helpless prisoners of a broken system.” As far as I see, the evidence (and there is quite a bit) indicates that we’re the broken component. Disengaged from public affairs, unwilling to work the political machinery. Here are a few of the many posts on the FM website looking at this question. Esp note the comments, the eager search for excuses — repeated cries of “it’s not our fault”. If excuses made a nation great, we’d be the greatest people in the history of the world! For the real story of this aphorism, and its applicability to us, see The first step to reforming America (the final version). What is the big deal about two-party system? One-party system in US would perfectly constitutional also. Number of parties – doesn’t matter. The Founders did not anticipate the development of political parties. In fact many, such as Washington, considered them to be “factions” and a bad thing. most political scientists today consider them an inevitable part of democratic governments.